The performances are lauded by celebrities, influential leaders, and arts aficionados all over. Audiences often come away feeling awed and inspired. Shen Yun, its Chinese characters meaning “the beauty of divine beings dancing,” according to its website, seeks to revive the 5,000 years of Chinese civilization through music and dance. Founded in 2006 in New York, Shen Yun’s annual productions have toured hundreds of theaters around the world, playing sold-out prestigious venues across North America and Asia. The company’s founders are artists in exile. Unable to present traditional Chinese arts within Communist China—where the campaign to destroy elements of Chinese history and culture during the Cultural Revolution nearly severed Chinese from their roots—they established Shen Yun so they could freely express their passion for China’s rich heritage. That is why the Beijing government, with its censorship regime that only allows state-censored performance, has continually tried to sabotage and undermine Shen Yun’s performances in America and beyond. Since Shen Yun’s early years, numerous cases of attempted interference from Chinese consulates around the world have been documented. Across cities in the United States, Beijing has enacted different tactics: consulates and embassies have sent letters to theater venues trying to persuade them not to rent to Shen Yun; Beijing’s state-run media have run paid ads in a U.S. newspaper defaming Shen Yun; Shen Yun’s sponsors have been harassed; and internet commenters are mobilized to post negative reviews online. In spite of Beijing’s efforts, U.S. theaters have remained largely undeterred; rather than caving to outside political pressure, they’ve chosen to support artistic freedom. Shen Yun now tours over 80 cities throughout the United States. But the efforts to deter Shen Yun’s performances began in earnest around 2010. In the United States, one of the primary means was through pressuring or threatening theater venues to not lease its space to Shen Yun. But the theater’s management ignored the letter. Shen Yun’s performances proceeded without a hitch. 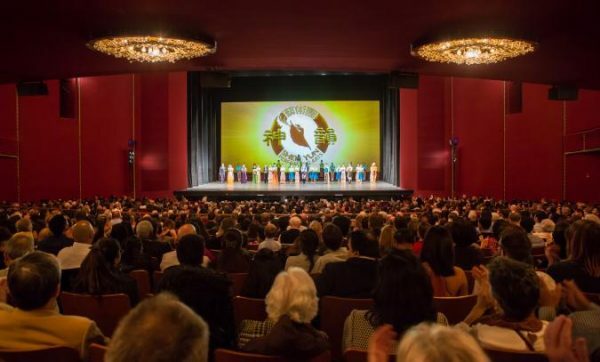 An official at the Houston theater venue where Shen Yun was due to perform several months later, the Wortham Center, also received pressure from the Chinese regime. But the official said he was not intimidated. The gesture seemed a pointed response to attempts at interfering with Shen Yun’s performances. Local Seattle media exposed the attempted intimidation tactics, with King 5, the local affiliate of NBC, broadcasting a TV segment on it. This is a well-established tactic. As early as 2007, Shen Yun staff have reported such pressuring of local officials, such as when the consulate in Los Angeles sent a letter to Orange County officials warning them not to support Shen Yun’s performances. Then-chairman of the Orange County Board of Supervisors ended up penning a public letter where he denounced Beijing’s attempts at pressuring officials: “Your letter is a formal request that the Orange County Board of Supervisors cooperate with your government’s suppression of Falun Gong…I am personally insulted by your request and will certainly not honor it,” Chris Norby wrote. Norby was referring to the Falun Gong meditation practice, a spiritual discipline severely persecuted by the Chinese regime since 1999. 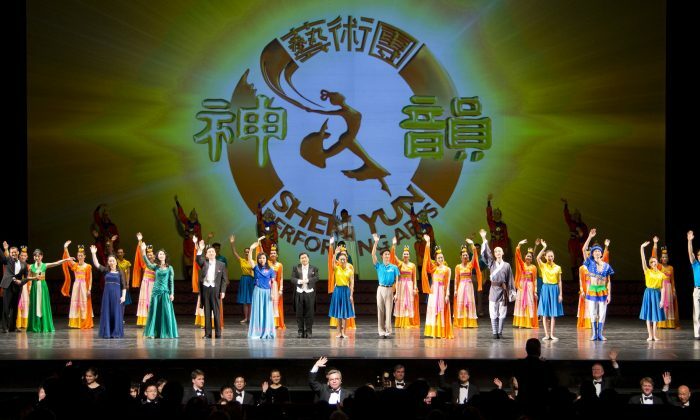 As a part of Shen Yun’s portrayal of modern-day China, some of its dances portray the ongoing tragedy of the persecution; many of Shen Yun’s founding artists are also adherents of Falun Dafa. Based on the principles of truthfulness, compassion, and tolerance, Falun Gong, also known as Falun Dafa attracted millions of adherents soon after its introduction in 1992. Beijing’s atheist regime soon grew concerned that Falun Dafa could pose a threat to the Chinese Communist Party’s ideology. In July 1999, then-Party leader initiated a nationwide campaign to harass, arrest, and detain Falun Dafa practitioners, while employing the state’s propaganda apparatus to vilify the meditation group and its adherents. Beijing’s fear of its brutal persecution being revealed to international audiences has fueled its agenda to systematically obstruct Shen Yun wherever it performs. When these attempts at pressuring officials and theater venues didn’t work, Chinese entities tried a different tactic. In Austin, Texas, in 2010, the Long Center theater where Shen Yun was due to perform received an unusual email. The correspondence came from a Gmail account called “Jianhai Chao.” In the email, the person begins with discussing an oil spill in the Gulf of Mexico. Then, the person claims to be a Falun Dafa practitioner, pleading for the theater’s audiences to channel their thoughts: “by this way, evils could be killed and resolved to blood water,” the email read. 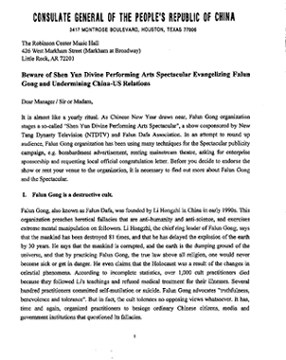 The theater staff, who shared the email with local presenters, suspected that the nonsensical ramblings were from Chinese entities posing as Falun Dafa practitioners in order to discredit them—similar to the propaganda disseminated in mainland China to justify to the public Beijing’s persecution. That same year in June, the Chrysler Hall in Norfolk, Virginia, which was also due to host Shen Yun, received an email from a purported audience member, who claimed she received emails from Falun Dafa practitioners that gave her a bad impression of them. The sender, bessie35@yahoo.com, ended the letter by predictably urging the theater not to host Shen Yun. Shen Yun’s performances went ahead anyway. That July, the Austin mayor sent a proclamation to the company congratulating it on successful performances. In 2015, officials from the Chinese consulate in Chicago met with a manager at the Peabody Opera House in St. Louis, Missouri. In person, the officials demanded that the theater cancel Shen Yun’s booking—or else it would harm relations between the United States and China. Theater managers were not impressed, and did not comply with the demands. The latest scheme that Beijing devised is more overt. China’s state-run English-language newspaper China Daily paid for an ad insert that appeared in the Washington Post on Jan. 25, 2017. In the insert was an article titled, ““Blasphemy masquerades as art,” that contained disparaging and false remarks about Shen Yun and Falun Dafa. It was a move meant to discourage U.S. readers from attending Shen Yun’s upcoming performances at Washington DC’s well-regarded Kennedy Center. It seemed DC residents were unfazed by the China Daily ads; Shen Yun’s week-long run at Kennedy Center was well-attended, according to local organizers. Despite Beijing’s bid to prevent Shen Yun from telling truthful stories about ancient and contemporary China, they worked to the contrary. Beijing’s schemes have fizzled, and on the contrary, audience members in the United States often happen to resonate with precisely the portions of Shen Yun’s storytelling that Chinese communist apparatchiks object to. “Their struggle for freedom was very touching…I think that for me, it renews my prayers for people in China to be free, to know the truth, and to be able to express who they are—to not live in fear of tyranny of the government,” said Rebecca Laird, an audience member during Shen Yun’s May 10 performance at the Shea’s Performing Arts Center in Buffalo, New York.